Researchers at MIT used new data from computer simulations to prove their initially proposed theory explaining the large-scale acceleration of electrons in Earth’s magnetotail. The computer simulation shows that an active region in Earth’s magnetotail is roughly 1,000 times larger than had been thought, which means the volume of space energized by these magnetic events is sufficient to explain the large numbers of high-speed electrons detected by several spacecraft missions. A mysterious phenomenon detected by space probes has finally been explained, thanks to a massive computer simulation that was able to precisely align with details of spacecraft observations. The finding could not only solve an astrophysical puzzle, but might also lead to a better ability to predict high-energy electron streams in space that could damage satellites. Jan Egedal, an associate professor of physics at MIT and a researcher at the Plasma Science and Fusion Center, working with MIT graduate student Ari Le and with William Daughton of the Los Alamos National Laboratory (LANL), report on this solution to the space conundrum in a paper published Feb. 26 in the journal Nature Physics. Egedal had initially proposed a theory to explain this large-scale acceleration of electrons in Earth’s magnetotail — a vast and intense magnetic field swept outward from Earth by the solar wind — but until the new data was obtained from the computer simulation, “it used to be people said this was a crazy idea,” Egedal says. Thanks to the new data, “I don’t get that anymore,” he says. 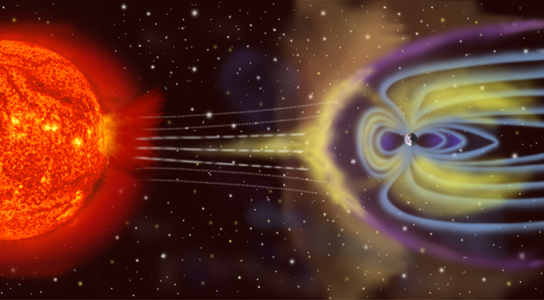 The simulation shows that an active region in Earth’s magnetotail, where “reconnection” events take place in the magnetic field, is roughly 1,000 times larger than had been thought. This means a volume of space energized by these magnetic events is sufficient to explain the large numbers of high-speed electrons detected by a number of spacecraft missions, including the Cluster mission. Solving the problem required a staggering amount of computer power from one of the world’s most advanced supercomputers, at the National Institute for Computational Science at Oak Ridge National Laboratory in Tennessee. The computer, called Kraken, has 112,000 processors working in parallel and consumes as much electricity as a small town. The study used 25,000 of these processors for 11 days to follow the motions of 180 billion simulated particles in space over the course of a magnetic reconnection event, Egedal says. The processing time accumulated gradually, squeezed in during idle time between other tasks. The simulation was performed using a plasma-physics code developed at LANL that rigorously analyzes the evolution of magnetic reconnection. Egedal explains that as the solar wind stretches Earth’s magnetic-field lines, the field stores energy like a rubber band being stretched. When the parallel field lines suddenly reconnect, they release that energy all at once — like releasing the rubber band. That release of energy is what propels electrons with great energy (tens of thousands of volts) back toward Earth, where they impact the upper atmosphere. This impact is thought, directly or indirectly, to generate the glowing upper-atmosphere plasma called the aurora, producing spectacular displays in the night sky. What had puzzled physicists is the number of energetic electrons generated in such events. According to theory, it should be impossible to sustain an electric field along the direction of the magnetic field lines, because the plasma (electrically charged gas) in the magnetotail should be a near-perfect conductor. But such a field is just what’s needed to accelerate the electrons. And, according to the new simulation, the volume of space where such fields can build up can, in fact, be at least 1,000 times larger than the theorists had thought possible — and thus large enough to explain the observed electrons. “People have been thinking this region is tiny,” Egedal says. But now, “by analyzing the spacecraft data and doing the simulation, we’ve shown it can be very large, and can accelerate many electrons.” As a result, “for the first time, we can reproduce the features” observed by the Cluster spacecraft. Although this analysis was specific to the phenomena in Earth’s magnetotail, Egedal says similar phenomena may be taking place in much bigger regions of magnetized plasma in space — such as in mass ejections that erupt from the sun’s corona, which occupy regions 10,000 times larger, or even regions surrounding pulsars or other high-energy objects in deep space, which are much larger still. In the future, he hopes to carry out simulations that would apply to the sun’s coronal mass ejections. “We think we can scale up the simulation” by a hundredfold, he says. Michael Brown, a professor of physics at Swarthmore College who was not involved in this research, says Egedal “is emerging as a real leader in experimental [and] observational aspects of magnetic reconnection,” and his co-author Daughton “is the recognized leader in state-of-the-art plasma simulations.” The new result “is very significant, and I think is surprising to the rest of the community. … I think this picture will gain more and more acceptance, and we have to go beyond” the presently accepted picture of plasmas, he says. The work was supported by grants from NASA and the National Science Foundation. Be the first to comment on "Researchers Use Computer Simulations to Explain Acceleration of Electrons in Earth’s Magnetotail"